THE “U.S.A.” OF THE EARLY NINETEENTH CENTURY was, in every way, a collection of separate and unconnected “Americas”. Cities were fewer in number, and the ones that did exist were hermetically sealed off from each other, each in their own orbits in a way that would end when telegraph wires and railroad tracks annihilated distance on the continent forever. At one end of the 1800’s, each town and village was its own distinct universe; at the other end, it was only one of many dots on a line chain-linking the nation as one entity. In the 21st century, there is only spotty evidence of the days when your town was, in a very real way, the predominant version of “the world” to you. The terms of survival were so very different. “In town” and “out of town” were measured in blocks, not miles. There was a pronounced sense of “how we do things around here”. Local accents were a clearer stamp of identity. News from outer regions arrived slowly. People’s lives impacted each other directly. And the towns first canvassed by photographers reflected the isolation of one city from another, for good or ill.
My parents met each other in a town that started small and stayed that way. It’s contracted now, the way a grape shrinks to a raisin; there is still enough of its old essence to identify what it was, but no hope for a future that resembles the past in any remote manner. I love making photographs of places in America where the feeling of apartness is still palpable. It is harder to be hidden away now. We are all one coast-to-coast nervous system, with impulses crossing the void in nanoseconds. The places which still say “our town” are often baffled off from other towns by raw geography….the mountains someone forgot to cross, the rivers no one wanted to ford. 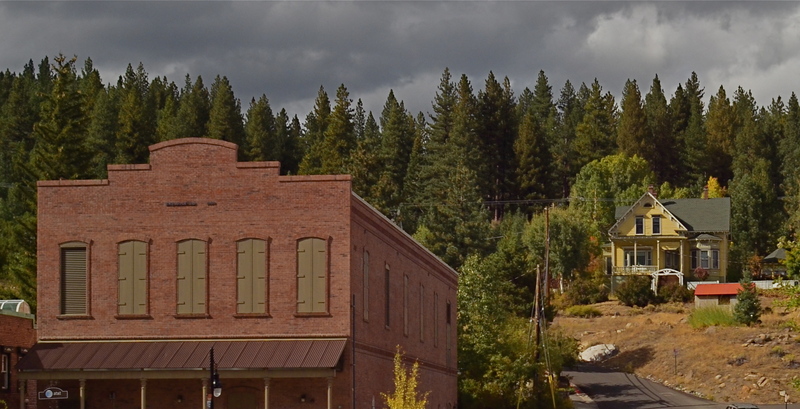 And, in the towns walled off by those last remaining barriers, as in this view of Truckee, California in the Sierras, there are still stories to be told, and images to be captured. I was struck in this picture by how close the residential and business parts of town were to each other, long before we all started spreading out and, well, getting away from each other. It creates a longing in me for something I can’t fully experience, and a desire to use my camera to come as close as I can. This entry was posted on November 11, 2017 by Michael Perkins. It was filed under America, California, History and was tagged with cities, landscape photography, Towns.